Model Name : McDonnell Douglas F-15E Strike Eagle Aircraft Desktop Wood Model Large. Dimensions: Length - 16.00" inches / Wingspan - 10.75" inches / Package Weight - 5.00 pounds. Material: Kiln-dried Mahogany - 100% Hand-crafted & Hand-painted. Stock Availability - Made-to-order FACTORY-direct. 4 weeks to make + 3 weeks Air Parcel Post to anywhere around the world. Mahogany Wooden Stand is included and detachable from the airplane model. 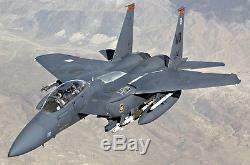 The item "McDonnell Douglas F-15E Strike Eagle Aircraft Desktop Wood Model Large" is in sale since Tuesday, July 9, 2013. This item is in the category "Collectibles\Transportation\Aviation\Military Aircraft\Desk & Shelf Models". The seller is "planemuseum" and is located in Metro Manila, Philippines. This item can be shipped worldwide.